From the wall to the art table in painted wooden. Works of art are not only for hanging on walls. They enter every environment of our everyday life. New decor items are born that until recently were unexplored. With this in mind, Mariani Affreschi company has conceived and developed new ways to apply its artworks. The idea was inspired by the decoration of some antique wooden panels. After viewing the finished product, the step towards designing the first “Art Table” was immediate. 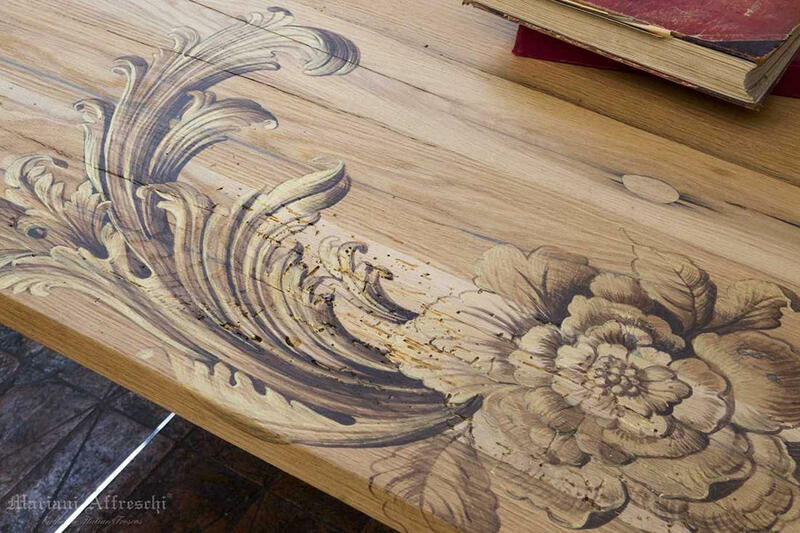 Prized antique wood and the skilled hands of an artist. The ingredients for making the Art Tables come from the tradition of Italian craftsmanship. 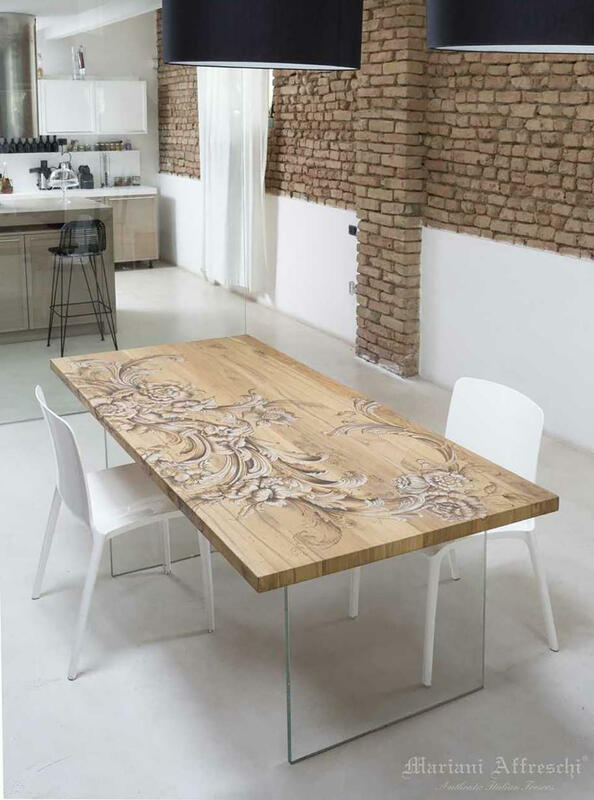 An artist needs a quality canvas to best express their work; in this collection, Mariani Affreschi proposes a highly natural base on which to paint: large antique oak tops or Venetian “Briccola” (wood recovered from antique posts of the Venice lagoon). Modern woodworking techniques allow assembling a multi-layered spruce wood base with a top layer in noble wood to cover both the top and sides, creating a precious surface while preventing the natural deformation of the surface. Once the top is ready to be painted, the work of the Mariani Affreschi artists begins. One at a time: art tables like unique works of art. The Mariani Affreschi laboratory has conceived six different themes whose shape, colour and nature are designed to be viewed horizontally. Neoclassical artistic models have been reinterpreted in a contemporary style by the Mariani Affreschi painters. 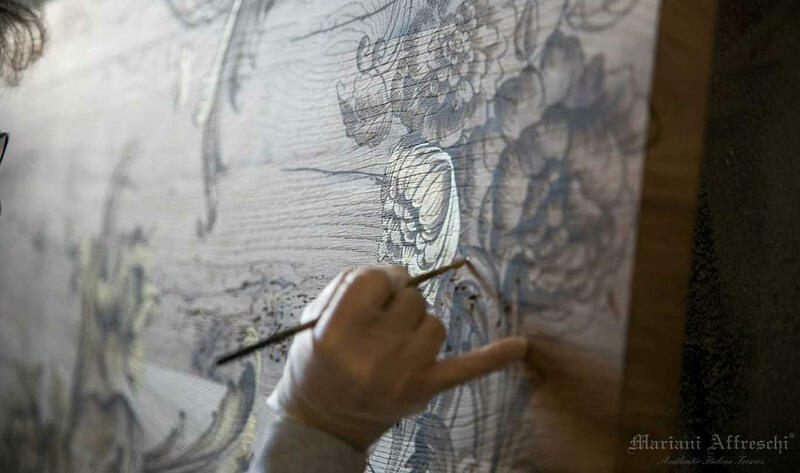 Each painting is executed meticulously by hand on the wooden top. The colours interact with the underlying layer, blending indissolubly. The Mariani Affreschi Art Tables are a concentration of Italian expertise and skill, which cannot be reproduced with the aid of machinery. The level of the finish is the expression of these Italian handcrafted skills. The human factor is indispensable in every stage of the creation process, which takes about 8 weeks for each table. Oltre alla scelta dell’immagine dipinta sul tavolo, Mariani Affreschi propone l’abbinamento con tre strutture: base in cristallo, base in acciaio a “V”, e base in acciaio a “X”. L’acciaio è prodotto in quattro finiture: bianco opaco, nero sablè, ruggine e acciaio lucidato. La scelta del basamento moderno conferisce al prodotto finito leggerezza e contemporaneità. Table height 77 cm. Top width: 90×160, 90×190, 100×220, 125×260, 125×125, 140×140. Coffee table height 40 cm. Top width: 70×130, 90×130, 100×100, 125×125. Thickness of wooden top: approx. 4 cm. As per the Mariani Affreschi tradition, the products can also be customised at the request of customers. A beautiful table made to last in time. A thin coat of colourless and matte paint guarantees the durability of the top. It also protects against the most common stains such as oil and coffee. 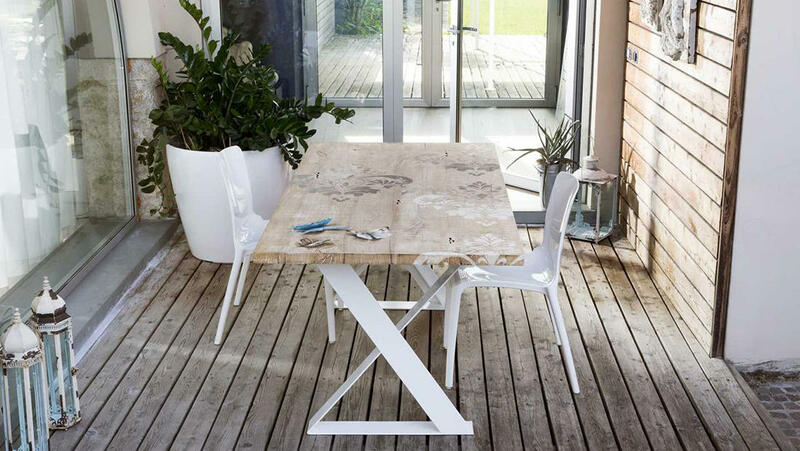 The Art Table can be cleaned with a normal damp cloth, without the use of aggressive or abrasive products.